Living many years in Cairns brought the joy of eating from Neptune’s bounty – a feast of the freshest seafood straight from the boats (or from your own boat), the nightly haul of mudcrabs sold live and trussed at Rusty’s Market the next morning, a raw slab of tuna, red and glistening, cut straight from the fish to take home for Friday night sashimi. There was never a question about freshness or quality, or whether the produce was from our sparkling waters or imported; everything was fresh, so the consumer could shop on price. Of course, that’s always the wrong question. In fact there’s only one question to ask about seafood: “Where’s the best quality, freshest local seafood?” Of course this brings in a couple of variables: availability of local sources and turnover of stock. Sustainability issues also need to be considered. Look for clear, plumped up eyes in the fish you buy (not clouded or sunken in). Thankfully, the availability and price of fish in major supermarket chains has improved. Our rule of thumb is Australasian for starters, the freshest and most local next. 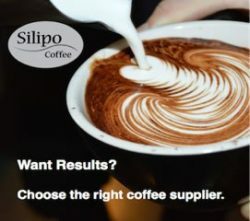 Here are a few large retailers you might like to try. They have different strengths, so shop around! Partners Salvi Vinaccia and Jim Stamoudis bring lifetimes in the seafood industry across the South Pacific to their joint venture at Charis. The shop has one of the best and most diverse displays of seafood on the coast, top quality and sparkling fresh. It’s one of the few big suppliers who also cook hot seafood to take away. Charis also has a top location, being situated on the Broadwater, so many people take advantage of the tables and chairs outside to eat fish and chips beside the water – the best dining room in the world! There’s only one downside: Charis is popular enough to need a parking station! Many Gold Coasters also give Charis iconic status for fighting the council some years ago for the right to feed the pelicans. The trawlers are our favourite place to buy fresh prawns and spanner crabs. 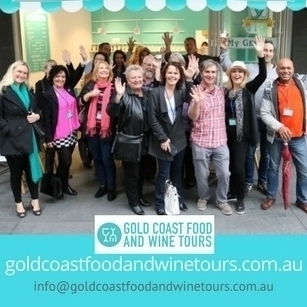 First established in 1970, the Gold Coast Fishermen’s Co-Operative was one of the first developments on the Spit at Main Beach. Despite some very public tangles with council, they are still there, located not far from the luxurious Palazzo Versace. Every night prawn trawlers, long line fishing vessels and a spanner crab boat operate off the Gold Coast, returning with a fresh catch to sell direct to the public from 7am. With great anticipation, we’ve sometimes driven to the Spit, only to find that it had been too windy to fish and the gates were closed. But you can find out about the daily catch available without leaving home. 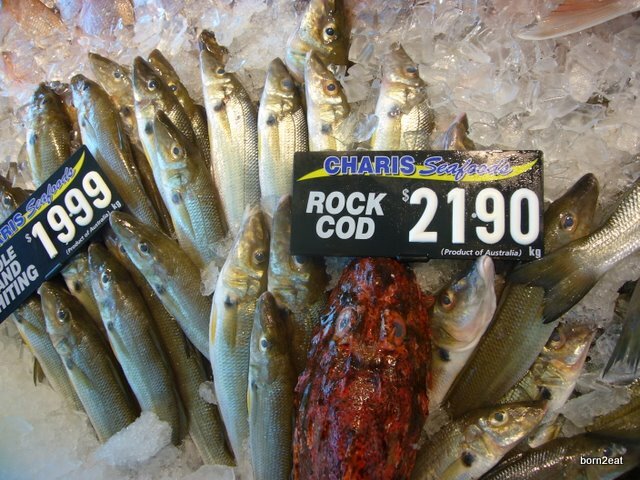 Check out their website for news of the catch, recipes and tips for handling seafood. Harbour Seafood Market, located diagonally opposite Harbourtown, is owned by Todd and Caroline Farmer. Well known for their oysters, freshly shucked daily, there’s a great range of fresh seafood including hot food available, cooked while you wait. Carmelo and Pauline Comi have made a huge investment in Gold Coast seafood with the opening of Pacifica Trading in late 2010, an imposing building not far from the new Varsity railway station. The retail outlet is situated on the ground floor, with wholesale offices above. The seafood displays are spotlessly clean and fresh and you’ll be served by courteous staff. Try the wood smoked salmon. Amazing! No hot food is available from this store. 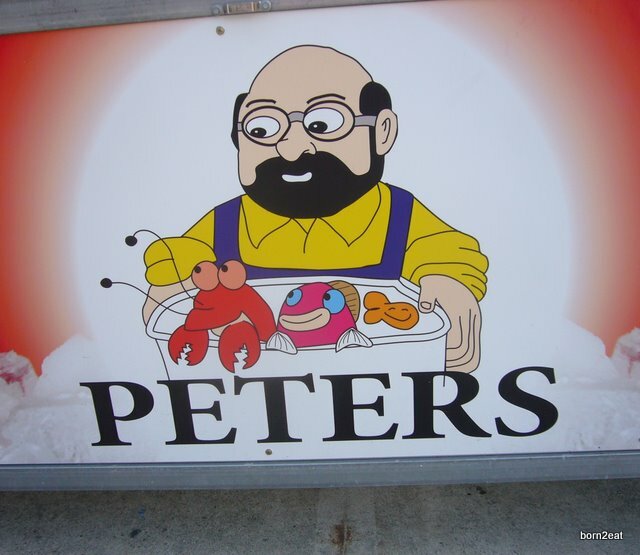 Another iconic seafood distributor, the smiling bearded face is known all over the coast. One of the few places where you can arrive on a boat or jetski to enjoy fish and chips, Peter’s is a favourite haunt of many Gold Coasters. Whether you take your seafood away to cook at home of enjoy a feast of cold and cooked seafood at the boat-shaped tables outside, the fish is always fresh and prawns straight off the trawlers berthed behind the shop. Located in the trendy Ferry Road Markets, Reef’s tantalising seafood display is complemented by arguably the most exquisite sushi and sashimi on the Gold Coast, prepared by Japanese chef Shigeki Uno. Priced according to its quality and location, it’s a convenient place to buy top quality seafood to take home, or seafood to enjoy with friends at this upmarket shopping venue. Their sushi is sublime! 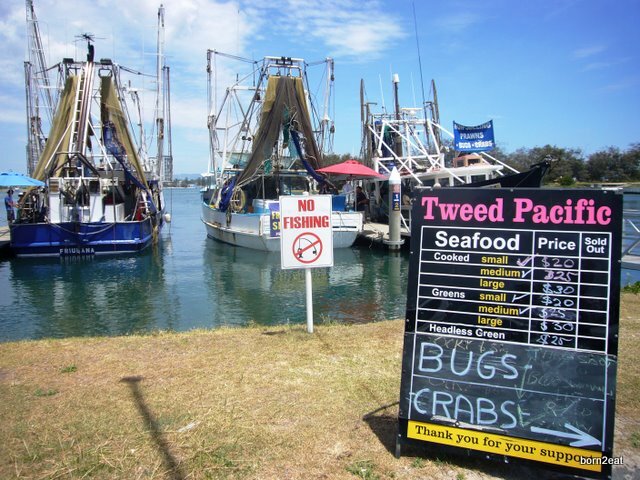 Tasman Star Seafoods is a wholesale outlet which sells to smaller fish shops but retails to the general public. As trawler owners with 20 years in the seafood industry, their display cabinets only stock Australian and New Zealand product. Oysters are shucked on site daily, and prices are keen. Give them your mobile number and they’ll text you specials.